Every year, my parents and I journey to Topsfield, MA for the Topsfield Fair, the oldest agricultural county fair in the United States. This October, we continued the tradition and attended the 200th annual fair on Saturday the 6th. At first, the day was like any other time we had gone to the fair: we trudged through the mud and muck of the parking lot to the actual fairground; I pet several baby goats and one hungry horse; my Dad unsuccessfully tried to win me a stuffed animal at the shooting game (it’ll be your year next year, Dad); I gorged on fried dough. But, as we walked through the Midway—the part of the fair with all of the games—I noticed one particular game booth. The game consisted of throwing ping pong balls into fish bowls. If you got a ball in a bowl, you won a cute little goldfish! The people that you surround yourself with and your environment can truly impact you, and bring out parts of yourself that you never knew were there. Something similar happened to me when I came to Emerson college. As soon as I got here, I realized that there was soooo much more diversity than there was in my small, very white, financially comfortable hometown in Norfolk, MA. For the first time I was speaking with people from countries all over the world, and I had the freedom to truly find myself and discover what really matters to me. The gym. It seems like a scary place. It’s filled with a lot of metal contraptions and machines that are supposed to help you work out, but in reality, you have no idea how to use them. There is also the potential of working out in front of people that you know, making yourself worry about judgmental glares 24/7. These are just some of the concerns that people like me had, making it impossible to make yourself actually go to the gym. For a while now, I refused to go to the gym. I never bothered getting a gym membership back at home and I just chose to work out on my own. This mostly included going on runs around my neighborhood or attempting to get in 20 push ups and sit ups in one day. But neither of these exercises forced me “lift,”the deadly word that was associated with gym folk. It wasn’t until this year where I actually started to force myself to go. If I had to listen to my soccer coach complain to me again about how I wasn’t “strong enough” I was going to get severely pissed off. When I sit in class, I can’t help but wonder what the meaning behind the colorful stickers plastered on my peer’s laptops. Laptop stickers are a means of self-expression and even art. At school, I have seen my fair share of fascinating and quirky laptop decorations. These stickers are often very funny and have even funnier meanings and stories behind them. I decided to hunt down some particular interesting laptops and decipher the meaning behind their decals! Now that the basketball season is over, I can openly admit that I might be the reason Emerson lost a few games… Okay, I get how silly it may sound but the curse has been proven. It all started in the game against Worcester Polytechnic Institute (WPI) when they lost by one point in a 74-73 game. After the first time, I did not think much of the loss. It was just unlucky, right? I continued going to games and they continued to lose. Some games by 5 points, some by 20 but it wasn’t until I visited Duke that I actually believed in my curse. If you aren’t familiar with Duke basketball, it is a HUGE deal. They are known for how many college players end up in the NBA, such as Kyrie Irving. To get tickets for these games, students legitimately camp outside of the basketball stadium for weeks. I thought that my friend was kidding about how intense they get, but then I got the chance to see it before my own eyes and actually got to participate in tenting. Never in a million years would I have thought that I would be watching myself acting on an AMC movie theater screen eating a banana. Low and behold, it happened, and I’m only a second semester freshman. I guess that’s just the life of a film student. My personal experience during the 48 Hour Film Festival could probably be summed up in two words: exciting and exhausting. You would think that making a three minute film in 48 hours was pretty simple, but it was far from it. Every group was assigned a different genre to work with, so the films all varied greatly in style, mood, and theme. Our team was given mockumentary as the genre, and luckily, our idea for the film came instantaneously. We created a mockumentary about “bro culture” explaining the life of typical frat boys in their natural habitats. It was designed to be an adaptation of the Planet Earth documentary, giving it a tribal atmosphere which was perfect for describing frat boys. Therefore, we named the film Planet Bro. The hardest thing for me about moving to college was not leaving my friends, family, own room, or even free food… It was leaving my dog. Sophie was everything to me, and still is. She was, in internet terms, a perfect floofer that I had the liberty of cuddling with when I was having a bad day, or when I just wanted some lovin’. My first week of Boston, I had somes serious pupper withdrawals; symptoms include: waking up in the middle of the night petting your pillow, having every background picture on your devices a picture of your pupper, and calling home and asking to speak with said pupper. I knew this could not continue, so when I heard about doggo Tinder, (Wag), I signed up immediately. The sign-up process and background check took about two weeks, and after that I was in! I began to get notifications from ever floofer, woofer, and pupper in a 2 mile radius. I could not believe my eyes as countless pictures flooded my phone of dogs who wanted to be walked by me, me! I accepted the first walk that was two miles away in South Boston, (mistake). It took me an hour to get there and I crossed two bridges, a major highway, and traversed through questionable neighborhoods. Nevertheless, I was thrilled about my first walk and was overjoyed to meet Sam, a pitbull mix. I continued to do Wag walks for the next few months, sometimes three times a day. The events that took place in Charlottesville, Virginia last week are nothing short of appalling. Watching the news has made me feel so incredibly sick. I’m upset, angry, and looking to make a change. As a young adult in the world today I am in an important place of power. I have the power to control the future of our nation by speaking up about important issues. I encourage you to do the same because every voice is valuable! Take an inside look into what happened in Charlottesville by checking out this documentary created by VICE. The footage gives great insight into the minds of some of the individuals involved with the rally and how their actions affected those around them. 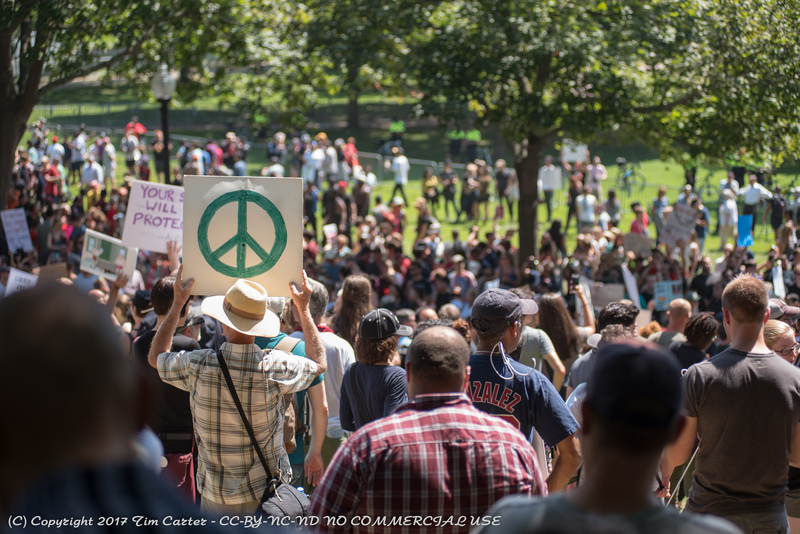 This past Saturday there was a free speech rally in the Boston common, and I have never been more proud of my city. Hate was met by an outpouring of love. The counter protest consisted of at least 30,000 individuals marching to fight bigotry and hate. The rally was for the most part peaceful and no extreme acts of violence were reported by the Boston police. There is just as much room for love in this world as there is for hate. I was feeling down and upset last week but after Saturday I felt my body fill up with hope. Boston proved that love can overcome hate. As far as what you can do, reach out to Republican state reps and speak up about the change you wish to see in our government. Every voice is important and speaking up is the best thing you can do at this time. We must bring these issues to the attention of local officials who have the power to invoke greater change. Every individual can impact a bigger change. Resist, resist, resist. Combat hate with love. Persevere. There are things going on everyday that inspire me to take action and I hope that more young people will educate themselves and get involved because we are the change.